After 500 years as a successful publicly owned institution, our Royal Mail was sold off to investors. We need to buy it back. The last shares of Royal Mail were flogged off in 2015. There weren’t any good reasons to privatise the organisation. It was making a profit and providing high quality service, in line with its obligation to treat every address in the UK and every bit of post equally. The Institute for Fiscal Studies, among others, criticised the effectiveness of the sale in reducing the deficit. The sell off was a way to raise quick cash, but it’s robbed us of a long term source of revenue, because Royal Mail makes millions in profit. 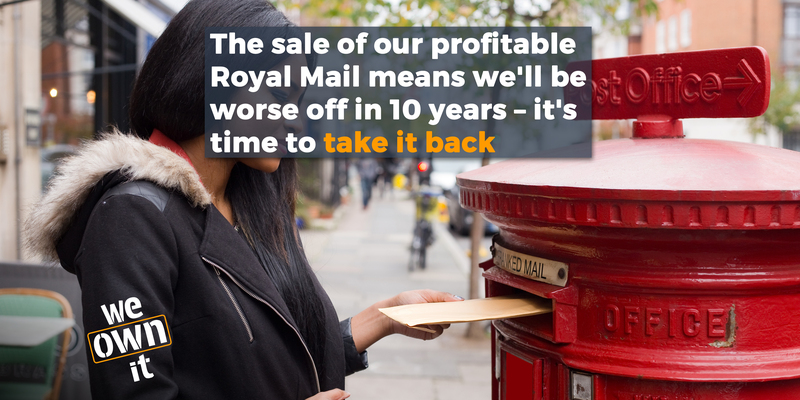 Our research, in collaboration with the New Economics Foundation, shows that by just 2025 – only 10 years after the sale – we’ll be worse off than if Royal Mail had remained public. Many of the shares were sold directly to investors and pension funds. A report for the Department for Business, Innovation and Skills said that “the taxpayer has missed out on significant value”. While the public lost out, some did quite well out of the sale – including, coincidentally, George Osborne’s best man. We’ve already seen stamp prices going up. There are real fears that privatisation will lead to more expensive and lower quality services. The Royal Mail has a ‘universal service obligation’ to provide postal services to every address in the UK. But there is a risk of this being abandoned in the long term under pressure from investors - which would effectively deny postal services to people living in rural areas. Watch our video below to learn why taking back Royal Mail is a great deal. 67% of us never wanted a privatised Royal Mail, and the arguments for public ownership are clear. The Labour Party’s 2017 manifesto contained a commitment to ‘reverse the privatisation of Royal Mail at the earliest opportunity’. As support for public ownership grows, and the Conservatives are in crisis, there's real hope of taking Royal Mail back into the public sphere, where it belongs.